that are operated by national agencies for hydrological and meteorological monitoring services. It doesn’t include those monitoring stations that are established and operated by specialized agencies for specific purposes. be seen from the table, telemetry is introduced in only five countries, namely, DRC, Ethiopia and Kenya. The telemetry system in DR Congo is part of the SADC- HYCOS. In most countries, meteorological monitoring started in 1900’s. 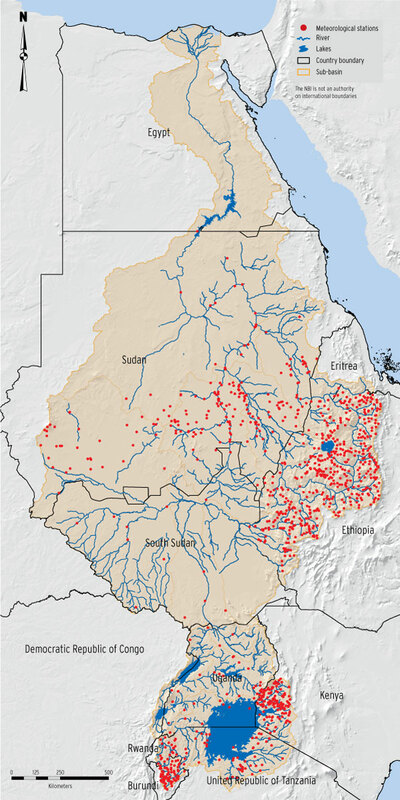 The Hydromet Project (1967 – 1992) boosted river basin monitoring in the participating countries, namely, Egypt, DR Congo, Sudan, Uganda, Burundi, and Rwanda. Over the years, however, the number of monitoring stations declined in some of the countries. Charts are provided for Burundi and Uganda to indicate the historical growth and decline in number of meteorological stations for which data was available. Hydrometric monitoring networks are defined as observations networks that primarily measure stream flow related parameters (primarily river/lake water levels and river discharge). In 2014, there were 427 hydrometric stations in the countries included in the survey. These registered stations primarily measure river/lake water levels and river discharge. In very few stations, suspended sediment load at rivers are measured. Most of the gauging stations employ staff gauges as the only instrument for water level measurement. The available capabilities of the countries with respect to hydrometric monitoring are shown in the table below. Telemetry for automated data transmission has been introduced in Ethiopia, Uganda and Tanzania recently. 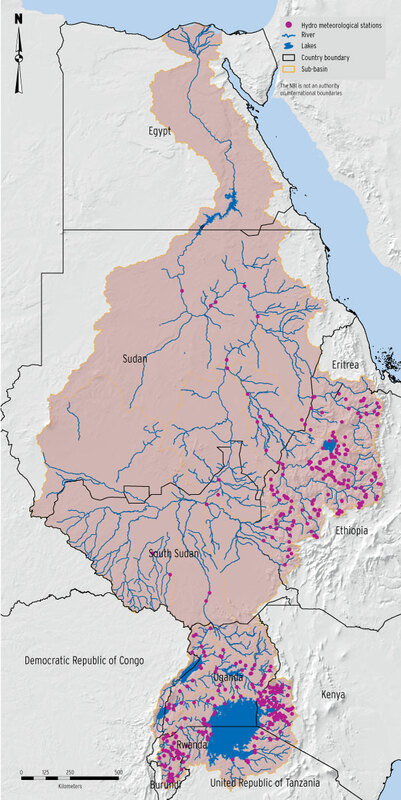 Water quality and sediment monitoring is practiced in very few countries, which is clearly a major gap in current monitoring networks in the Nile Basin. In most countries there is not sufficient capability (laboratories, mobile calibration labs, field sampling kits). In most countries, groundwater monitoring is virtually non-existent. 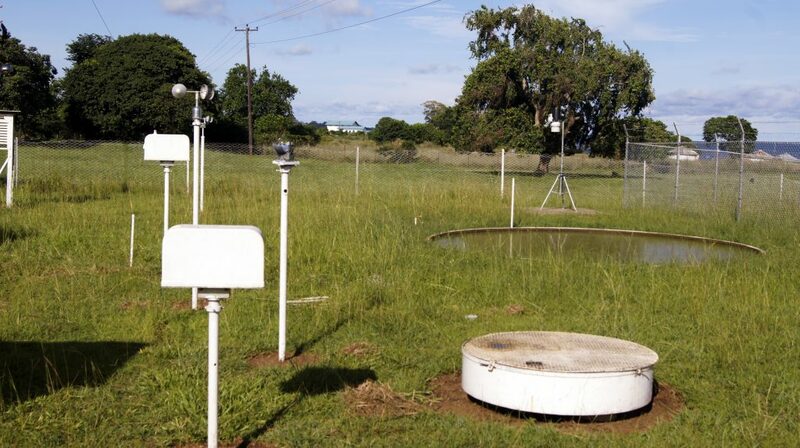 Comparatively, Uganda has the largest groundwater observation network that includes 30 groundwater monitoring stations. The situation with respect to data management and data communication capabilities is shown in adjacent table. None of the countries with the exception of Kenya, Uganda and Tanzania employ systematic data storage and management tools for managing the hydro-meteorological data. Only in few countries, for example in Ethiopia, Uganda, Tanzania telemetry system has been introduced to support near-real time data transmission. Egypt, DRC, Sudan, Uganda, Burundi, Rwanda.